Eight years, and over three hundred weddings under my belt, I can tell you that one of the Best Wedding Venues in Miami hands down is the Biltmore Hotel. It's just such a beautiful place and that is just the beginning. The Biltmore hotel in Miami is as much accommodating as it is beautiful and that is a really important aspect to consider when searching for a wedding venue. The property is massive, so much so that I have actually seen more then one wedding going on at the same time and you would never even know it! That's pretty incredible! While I am sure some brides maybe turned off by that concept, I am here to say that it's not something that I have ever seen as an issue. Getting back to this image specifically, this was one of the setup shots for my client's Leslie and David's wedding. They had a celebrity guest list of over 300 people and this was the main dinning room that they had. The level of detail, decoration and thought (not to mention planning) was just incredible. This even "took my breath away" when I walked into the room, and I am someone who has seen a lot A LOT of weddings. 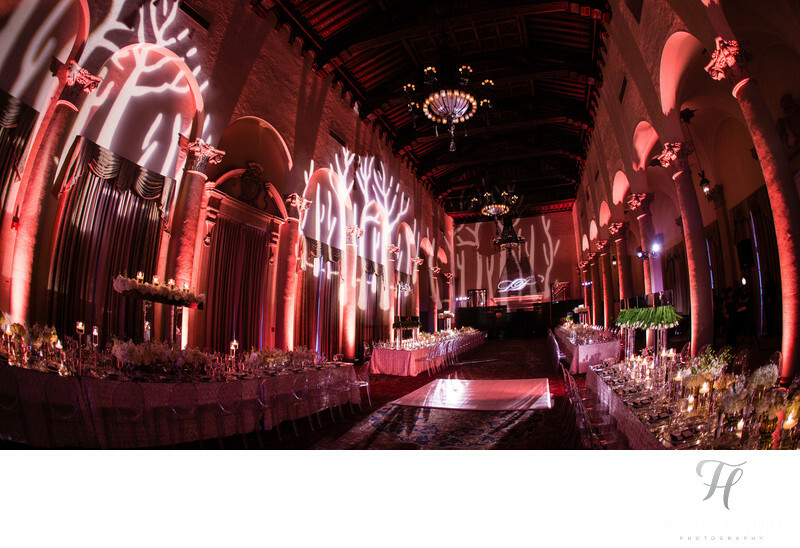 So, for sure consider the Biltmore Hotel for your wedding location because it is definitely one of the best in Miami.